Al Collins is a rather forgotten and ignored figure nowadays, probably because of his lack of recording activity. In the Dance Band heyday, however, he played an important part with the Savoy Group of Hotels, spending almost all of his professional life working for them. 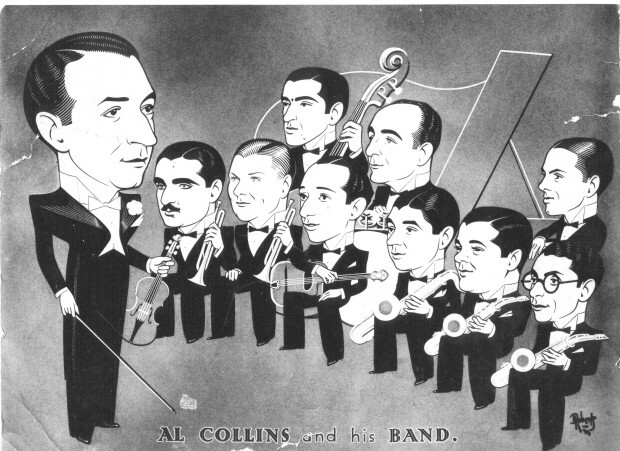 Born in London, Al Collins went to America in his teens and remained there throughout the first World War, working as a violinist accompanied by a young Billy Mayerl on piano. Returning to England in 1919, he lead a band at the Piccadilly Hotel for David de Groot for over a year until William de Mornys of the Savoy Hotel group discovered him and put him in charge of a small dance band at the Savoy Hotel. The hotel bands in those days didn't have a name, incidentally. In 1920, de Mornys placed him in charge of the dance music at Claridge's Hotel. Claridge's was a sedate establishment, requiring dance music to suit and Collins provided it with a five piece band consisting of Ben Tucker, sax; Collins, violin; Dave Comer (formerly in the old Savoy Quartet), piano; Hyatt Berry, banjo; Sid Racklin, drums. (This was the line-up in 1925 - see photograph) The band was augmented in 1927 by Will Dannan (tenor sax) and Charlie Jones (tuba). For the 4 Regal recordings of 1923, the band was augmented to the "normal" recording band size by 2 trumpets, trombone, 2 extra saxes and tuba, possibly using musicians from the other Savoy Bands (i.e. The Savoy Havana Band & the Orpheans). 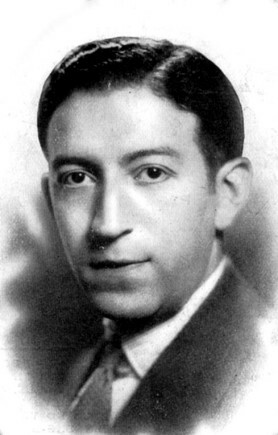 According to William De Mornys, manager of the Savoy Hotel Group, if any of the rather brash American musicians in the Savoy Orpheans or Havana Band started playing up by jazzing numbers when they shouldn't, de Mornys sent them to Claridges for Al Collins to use; the restaurant manager there would not tolerate any loud jazz, and would complain to de Mornys if any were played at his establishment. In 1929 - 1930, Collins transferred to the main Savoy Hotel, sharing the musical duties with Arthur Lally and later with Percival Mackey. He only made one recording during this period, a semi-private recording for Columbia. In 1932, Collins switched to the Berkeley Hotel (still part of the Savoy Group) where he remained for many years, continuing his policy of melodious dance music as is proved by his four Decca recordings of 1936 and the later "Music While You Work" medleys. Later on he left the dance music scene and played violin for various 'straight' orchestras before retiring to Israel where his son and daughter were living. He soon returned to London where he had an interest in an amateur orchestra right up until his death in 1964. As mentioned above, he made very few recordings, considering his long career at some of the top hotels. The only commercially issued ones during the pre WWII era were 4 titles for Regal in 1923 whilst at Claridges and 4 titles for Decca in 1936 whilst at the Berkeley. In 1944 & 1945 he recorded several sets of medleys for Decca's "Music While You Work" series. Acknowledgments: Dance Music At The Savoy Hotel and Signature Tunes, both by Chris Hayes. SAVOY BAND, conductor AL COLLINS: Al Collins-vn dir: 2t/tb/?Ben Tucker and another cl-as/ts/p/g/sb/d. AL COLLINS AND HIS BERKELEY HOTEL ORCHESTRA: Al Collins-vn-dir: Arthur Lousley - Norman Payne - Bill Shakespeare-t /Bill Mulraney and another-tb /Jack Miranda and another-cl-as /Harry Hines-cl-as-bar-a /Ben Tucker-cl-ts /vn/ Pat Dodd-p/ Eddie Freeman-g/ Al Burke-sb/ Ronnie Gubertini-d/ Suzanne Botterill - Jimmy Leary - Bert Yarlett-v.
DR-9100-2 Swinging On A Star / Choc'late Soldier From The U.S.A.